Top off your outgoing mail with a symbol of hope and salvation for the world! 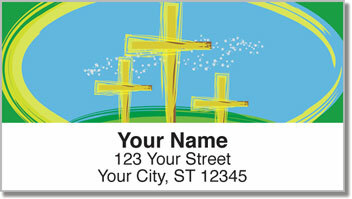 These Christian return address labels feature an illustration of the three crosses at Calvary in four attractive color combinations. It's a vibrant way to express your beliefs and spread the Gospel on every piece of mail. You'll find these labels are a blessing for another reason too. They are printed on stock with a convenient, self-adhesive backing. That means you can simply stick them on to anything that goes in your mailbox. Plus, they can also be used to mark personal property with your name and address. 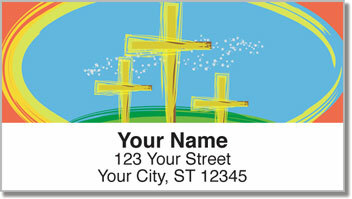 Order your very own Christian Cross Address Labels from CheckAdvantage today! Get them with matching personal checks.